Incapacity and Theatricality acknowledges the distinctive contribution to contemporary theatrical performance made by actors with intellectual disabilities. It presents a close examination of certain key theatrical performances across a variety of different media, including John Cassavetes’ 1963 social issues film A Child Is Waiting; the performance art collaboration between Robert Wilson and Christopher Knowles; and the provocative pranksterism of Christoph Schlingensief’s talent show mockumentary FreakStars 3000. Tracing a global path of performances, Incapacity and Theatricality offers an analysis of how actors with intellectual disabilities have emerged onto the main stage, and how their inclusion calls into question long-held assumptions about both theatre and intellectual disability. 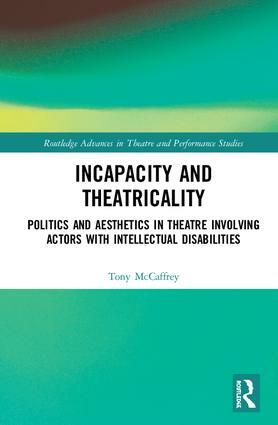 For postgraduate students, or anyone interested in the shifting dynamics of twenty-first century theatre, McCaffrey’s work offers a vital consideration of the intersubjective relations between people with and without intellectual disabilities and ultimately addresses urgent questions about the situation and representation of the contemporary subject caught up somewhere between incapacity and theatricality. Tony McCaffrey is a Lecturer in Creative Industries at the National Academy of Singing and Dramatic Arts, Ara Institute, Christchurch, New Zealand. In 2004 he established the Different Light Theatre Company, an ensemble of performers with intellectual disabilities.